Sustainable Aquatics (SA) is proud to introduce its new Sustainable Islands Project, (SI). What is the SI Project? For the first time, the SI project makes available to retailers fish which are completely acclimated to aquarium life. This means that they exhibit good color, health, acceptance of a wide variety of prepared aquarium foods, are free of disease, and are “socially acclimated” to aquarium conditions and to humans. This enables a high survival rate through retail sale and into the hobbyist aquarium. Collecting these small fish is more ecologically-friendly than collecting large, mature animals since the larger animals are survivorsthat we need to leave in the ocean as breeder fish and the smaller, younger animals typically have a low survival rate to maturity in nature. Shipping smaller fish is also more ecologically-friendly and economical. The fish have higher survival, and since the amount of water shipped per fish is much reduced, shipping costs are also much reduced. During the months these fish spend in the SI facilities, these fish learn important new social behaviors which give them much higher survival rates in the trade. Fish in the wild live in a world of scarcity, and many are fiercely territorial — behaviors that often result in losses as they compete for food and territory in aquariums. 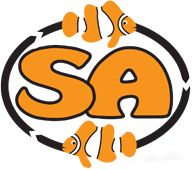 SA’s methods and facilities encourage fish to eat well, often doubling or tripling in size in a relatively short time while socializing to the aquarium environment. Until and if protocols are developed for breeding these open-water spawners, the SI project is the most sustainable and responsible method for bringing these important species to the hobbyist. Limited releases are now available. Initial availability includes The Pacific Blue Hippo Tang, several varieties of damsel, two species of wrasse, a clownfish, and a goby. We plan to continue releasing an increasing variety of fish from the SI Project in the near-future!